Joel Bernstein and Rebecca Gaon of Cavendish Studios designed the Mayfair Pop Up for Maiyet, the highly regarded New York ethical and luxury fashion brand. Joel spoke to us about his love of clay plasters, and why they were such a perfect fit for this project. ‘The whole idea of how you brand an interior space has changed dramatically. It comes down to identifying the values and ethos of a place: what does it stand for and how can you communicate that in a consistent way. Maiyet have extremely strong ethical and sustainable values and partners with global artisans to incorporate exquisitely handcrafted details and unexpected fabric techniques into their collections – all sourced globally and made locally’ he explained. ‘There is a whole momentum towards natural materials and clay plasters feel almost tribal and yet they are so sophisticated. So elegant. They feel earthy and soft and organic’. Only naturally abundant natural clays, aggregates and fibres are in clay plasters – no synthetics, lime, gypsum or cement – and they are coloured with naturally occurring mineral pigments. For thousands of years clay has been dug up on site and applied directly, but now with the application of modern geo-scientific knowledge, ingenuity and testing facilities it is available ready-mixed and easy to use. When Joel suggested clay plasters for Maiyet, Linde Davies from Clayworks entered into the discourse with a large portfolio of samples and ideas of how to achieve the designers dreams and Joel and Rebecca created a palette of soft, terracotta and blush hues and textures. ‘I particularly love the fact that the colours are close together and yet tonally so different’ said Joel. ‘The way they capture and play with the light was important for this project’. As clay plasters ‘set’, they do not go through a chemical reaction which is one reason the earthy textures are retained. It is also the reason why 3 dimensional sculptural shapes and patterns can be achieved. ‘What you can do with clay is infinite and a designers dream’ said Joel. One of the specialist artisan plasterers Clayworks works with is Guy Valentine. A master of his craft, Guy knows instinctively how to achieve the finishes envisaged by the design team and for this project he translated the patterns imagined by the designers into unique, subtle decorations on the sides of the display. From mood board to finished project in 2 weeks. The unique luxury retail concept, that was always going to be temporary, led Joel and the team to ponder and play with the materiality of clay plasters as a new and creatively ingenious finish in an innovative retail display of stacked furniture. 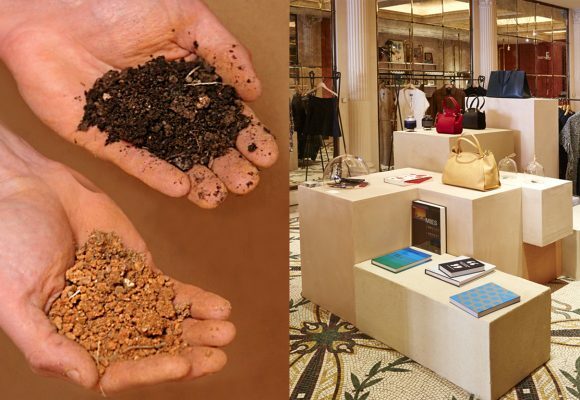 A display that captured the attention of Vogue UK who were intrigued by the idea that by adding water to the clay plasters, they can be dissolved back to the natural materials from which they were formed. The project took 2 weeks from mood boards to the finished items.